On 30 September and 01 October 2010, you have the opportunity to take part in a post-conference field trip to a very well exposed fold-and-thrust belt of a Variscan foreland basin in the SW coast of Portugal. The structures are magnificent and crop out in beautiful beaches and scenery. 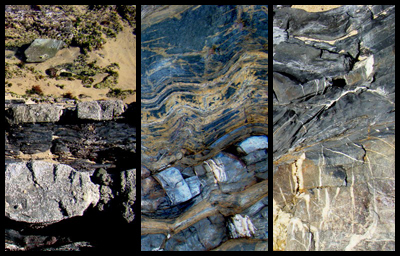 Most of the photos in the banners of the GeoMod2010’s webpage are from the field trip area. The present-day knowledge of the outcropping rocks indicates that they deformed under conditions of diagenesis, with a peak reaching very low grade metamorphism. This raises the question of how rocks can flow at temperatures below 150-200 ºC, and stimulates the discussion of very low temperature deformation assisted by fluids. Therefore the field trip aims at discussing modelling of structures as diverse as folds (multi and single layer), cleavage, faults, boudins and veining under very low temperature and assisted by fluids. Ultimately we will discuss how far modelling is from reality.